If it seems as though I am always in the kitchen making some sugary sweet concoction you are right. I just can't stop myself with all this amazing fruit around just waiting to rot. So this weeks adventure was making star fruit jam. 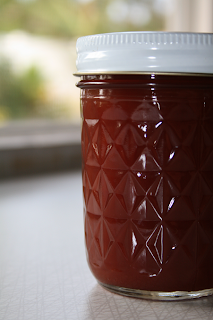 I prepared over 150 star fruit for this batch which yielded 20 cups of juice and 10 jars of jam by the time it cooked down. I usually make this jam chunky, but was not in the mood for all the chopping involved so..... here is what I did this time around. 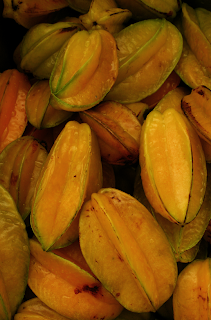 Start by washing the star fruit, and then trim tops, bottoms and down each vein. Cut into large over a large bowl or pot to catch all juice. 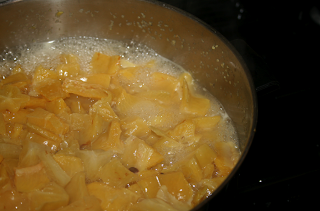 Bring to a boil to soften the fruit and release more juice. I also added several large slices of ginger root to this for a bit of a kick. 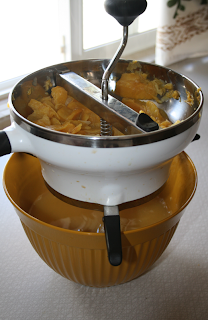 Transfer cooked fruit to a food mill and extract pulp. 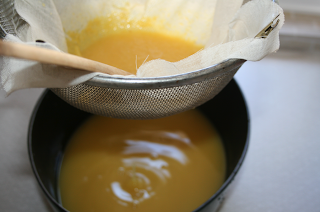 Then place some cheesecloth in a strainer and pour through to remove all the pulp the food mill allowed to pass through. You will need to help it through by stirring it a bit with a spatula or wooden spoon. Then pour all juice into a large pot with the desired amount of sugar pectin and lemon juice and cook down until the back of a wooden spoon coats and is desired thickness. The finished product. 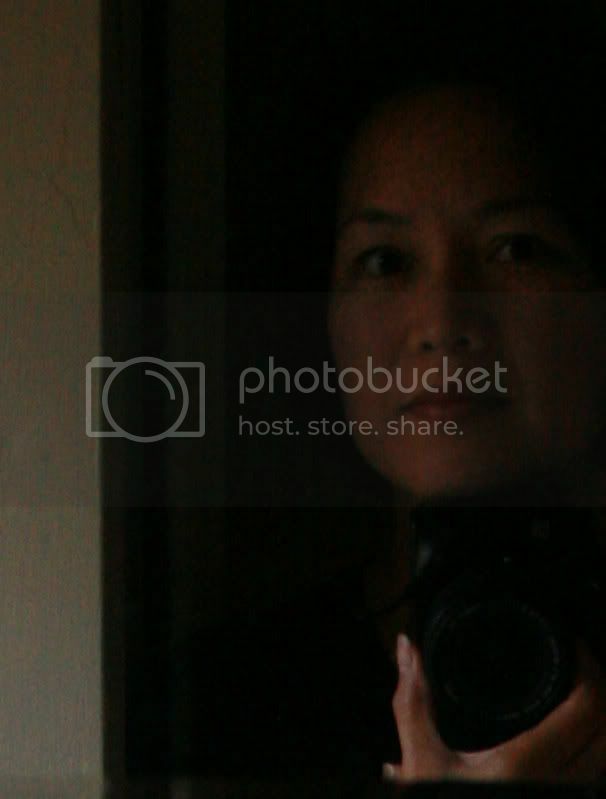 Yes believe it or not this is it. 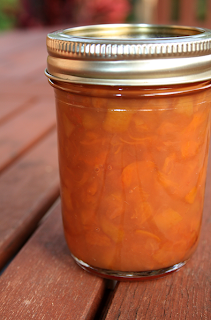 I slow cook mine, still bringing it to a slow boil which takes longer, but it gives the fruit a great caramel flavor and color. Here is the chunky version, which takes a bit less time to cook in my opinion. The color gets less caramel as a result. Both taste the same. Okay, I'm seeing a side biz involving a roadside stand :-D Or maybe take some over to Down To Earth! I've never had starfruit jam, bet it is yummy! you'd think I would sell it... but I end up giving it all away. the flavor is not really at all like eating a fresh starfruit. it's a hard flavor to describe. :-)Giving it away makes it taste even better. Wow, they look so good... wish we have a starfruit tree in the backyard!